With our abundance of imported tropical plants and lawns, many Southern Californians don’t know that our state actually has its own variety of unique native plants, including aromatic sages, coastal live oaks and redwoods, and showy wildflowers. Although many of these plants are threatened by development and climate change, native plants lovers are working to keep California’s ecosystems healthy. Two of the most well-known California native plant enthusiasts were Theodore Payne and Lester Rowntree, horticulturalists who led a movement in the early 20th century to protect native species and habitats from agriculture. Theodore Payne established native plant gardens in Exposition Park, Santa Barbara, and at Caltech, and the Theodore Payne Foundation carries on his work today. Lester Rowntree was known for living outdoors as she traveled the state studying wildflowers and other native plants, and shared her knowledge through numerous lectures and publications. Thanks to Payne, Rowntree, and other conservationists, today’s California gardeners have a wide variety of beautiful natives to enjoy. If you’re new to native plant gardening, here are a few easy varieties to get you started. If you’ve ever burned a sage bundle as incense, this was probably the plant you used. Sacred to the Chumash and other indigenous peoples, white sage in the wild is unfortunately threatened by poaching and overharvesting, so growing it in your garden can help keep its population healthy. Just plant it in well-drained soil, water it a little when the soil feels dry, and watch it grow. Drop a few leaves in a pitcher of ice water for a refreshing and medicinal drink! If you live in the city of Los Angeles, chances are your soil is compacted and has a high clay content. It can be hard to grow plants in this environment, but sagebrush is up to the challenge. Aromatic with soft, feathery leaves, sagebrush will quickly grow into a large shrub with regular light watering. When you prune its branches, try arranging them in a vase with cut flowers. Ever wonder how Hollywood got its name? This large shrub has bright red berries that resemble holly, and early European settlers found it growing across the L.A. basin. You can plant it as a privacy hedge or a focal point in your garden and watch birds enjoy its berries in the winter. The queen of California natives! Every year, people flock to areas like the Antelope Valley to see the poppies bloom, but you can also enjoy them in your own yard. Mix the seeds with a little sand to keep birds away, then scatter them on any bare patch of earth. Rake them a bit, then either water regularly or let the rain do the work. Soon you’ll have your own miniature poppy field! 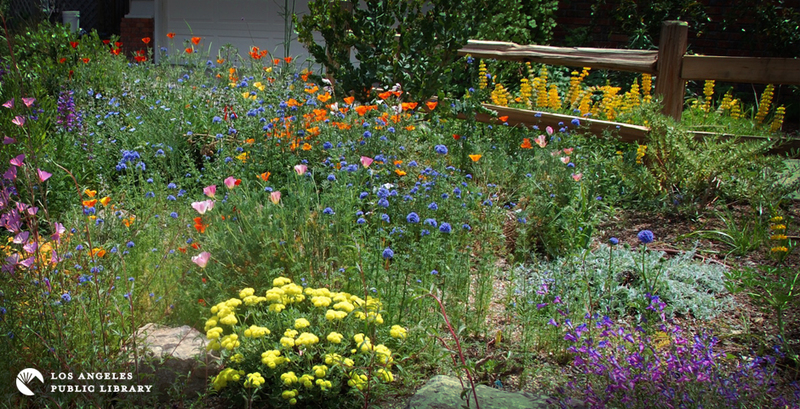 Be careful, though—once California poppies get established, they can start sprouting up all over your yard.